Download the latest version of the blockquote module. Blockquote is a simple extension that allows you to add your own custom quote to any module position in your Joomla install and have it displayed in the front end. This simple module contains a text area for your quote and outputs your quote in any assigned module position within <BLOCKQUOTE> tags. Optional parameters include attributing the quote to the author/speaker output within <CITE> tags and adding a URL to the original quote if it was taken form an online source using the cite attribute. There are also options to position the module on your page position more accurately and you can opt for the module suffix feature to style with CSS. All releases have alliterative code names, following the same format as Ubuntu releases, using an adjective and an animal. The first release is Angry Antelope. Names follow in alphabetical order to make it easier to tell the latest release. 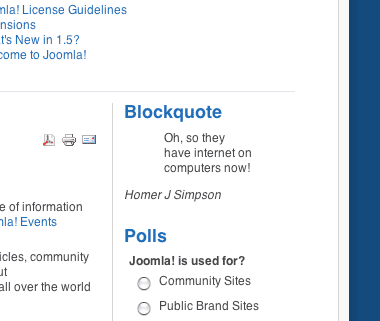 Blockquote Module shown in the front end of Joomla in the default Milkyway template. Updates: This page will be kept up-to-date with the latest releases of this module, release notes, update instructions and news. Legal Notice: This software is released under GPLv3 license. Thank you for providing this Joomla extension. I have just installed it and it works very well. I would like to know if there is any documentation about styling the quote and the extra positioning properties that you mentioned in this article. I do not understand. “citations in the module is replaced by time or not? Thanks for this blockquote plugin. It’s very easy to put in Joomla and customise as you want.